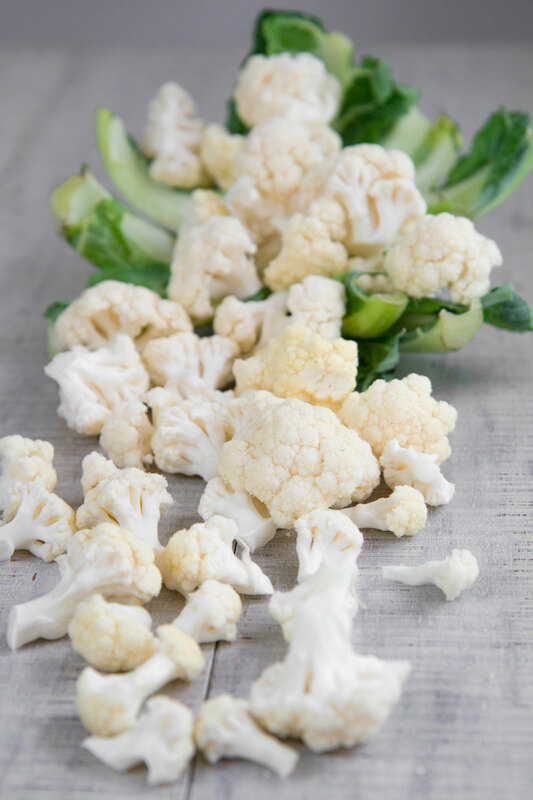 You are here: Home / Gluten Free / GIARDINIERA RECIPE: the Italian pickled vegetables appetizer! The first recommendation is: use only canning jars and never reuse lids! Sterilize the jars and lids in a water-bath canner or large stockpot. You may use some clean dish cloths in order to protect the jars during the boiling treatment. Boil the jars at least 20 minutes. It’s critical the jars stay fully submerged during all the process. After that, lift of the jars with a jar lifter. 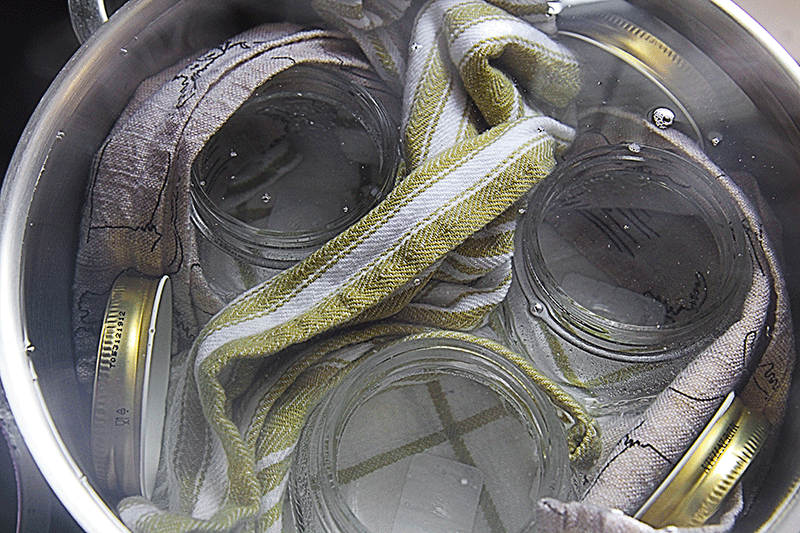 Place the jars, and lids upside down on a rack lined with a clean dish cloth and let them completely dry. Once dried, fill the jars as soon as possible; otherwise, sterilize again. First of all, rinse all the vegetables. 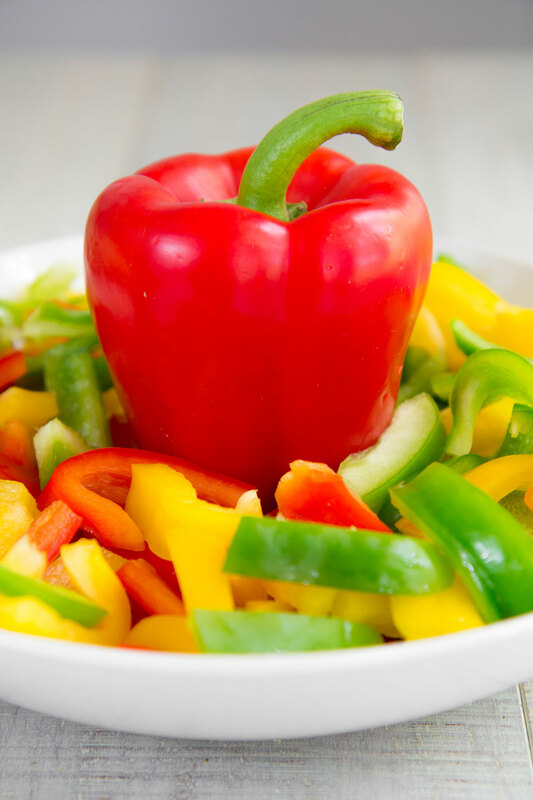 Cut the bell peppers into half, discard the seeds and reduce the peppers into sticks long 1 or 2 inches. 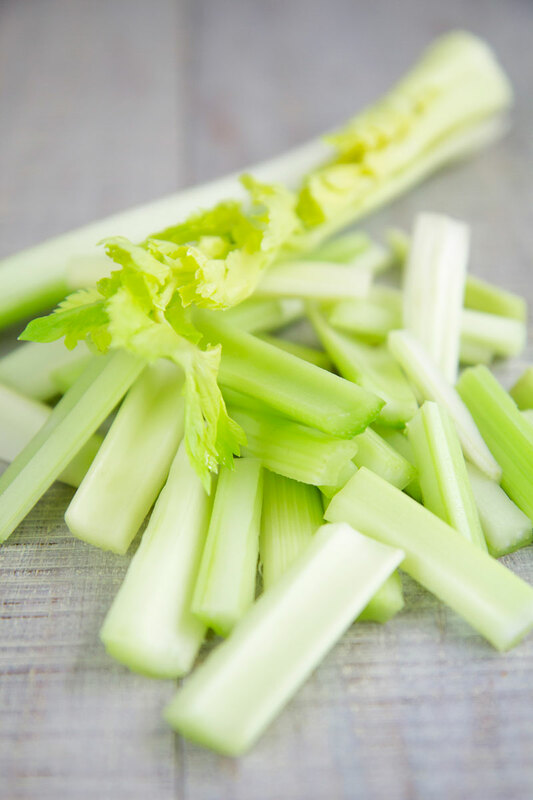 Reduce into sticks the celery, and green beans, and baby carrots as well. Now, separate the cauliflower’ tufts. Finally, cut the cucumber into rounds and the white part of the spring onions into halves. If you prefer, reduce the vegetables into smaller pieces. Now, pour 9 cups of white wine vinegar in a pot along with 9 cups of water, the juniper berries, the mixed peppercorn, the sugar, and the salt. Bring the mixture to boil, then pour the vegetables covering with a lid until the liquid starts to boil again. Remove the lid and simmer the vegetables 3 minutes, then raise the vegetables with a slotted spoon and pour them into the jars leaving 1 inch of space between the vegetables and the lid. Finally, add the water and vinegar mixture in order to fill the spaces between the vegetables, saving 1/2 inch of space between the liquid and the lid. Be sure all the vegetables are fully submerged in the vinegar brine and close the lids. SHORT TIME CANNING: let the Giardiniera reach room temperature stored in the jars, then place in the fridge. Serve Giardiniera after at least 3 days up to 7 days. 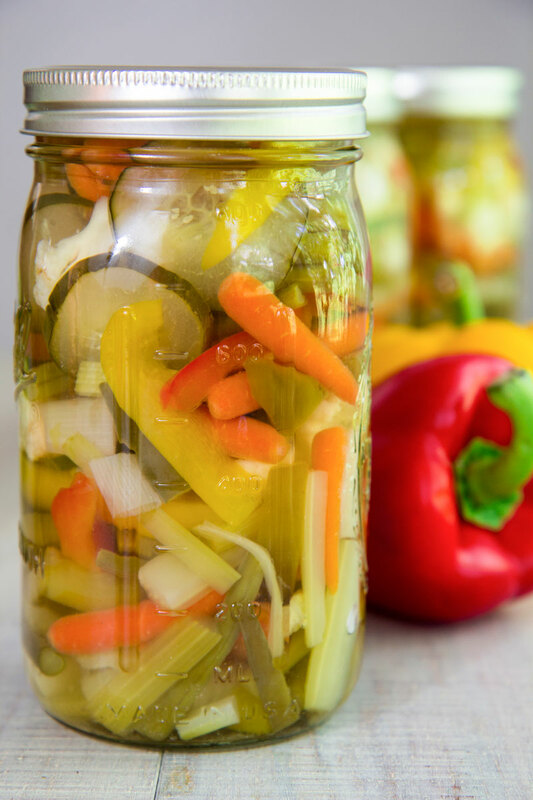 LONG TIME CANNING: this is the most traditional way to preserve Giardiniera in Italy: the vegetables are stored at least 1 month up to 6 months before being eaten. The long time canning requires a water-bath and a dry, dark and cool place where store the jars. But, long time preserving could be dangerous if not done properly, so I strongly suggest you read the USDA Guide to Home Canning carefully. The Italian Giardiniera is an ancient recipe for pickled vegetables. 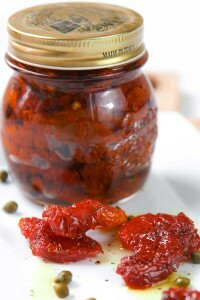 It is also called Giardiniera Campagnola (Rural Giardiniera), because it was one of the most traditional ways to save the overabundance of the production by the farmers, and store a spare of fresh vegetables before the winter. 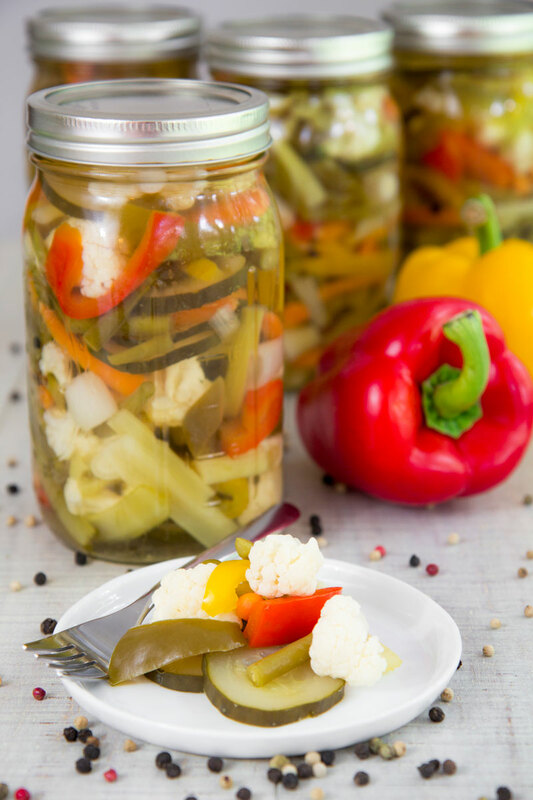 Giardiniera recipe is a "must-to-try" of the classic Italian "aperitivo" (aperitif), and delicious paired with meats and cheeses for a fantastic Italian BBQ. The vegetables may vary depending on the availability of the garden, but commonly the ingredients I choose, compose the classic Giardiniera mix! Now, pour 9 cups of white wine vinegar in a pot along with 9 cups of water, the juniper berries, the mixed peppercorn, the sugar, and the salt. Bring the mixture to boil, then pour the vegetables covering with a lid until the liquid starts to boil again. Remove the lid and simmer the vegetables 3 minutes, then raise the vegetables with a slotted spoon and pour them into the jars leaving 1 inch of space between the vegetables and the lid. Finally, add the water and vinegar mixture in order to fill the spaces between the vegetables, saving ½ inch of space between the liquid and the lid. Be sure all the vegetables are fully submerged in the vinegar brine and close the lids. I love this giardiniera recipe! It looks delicious. 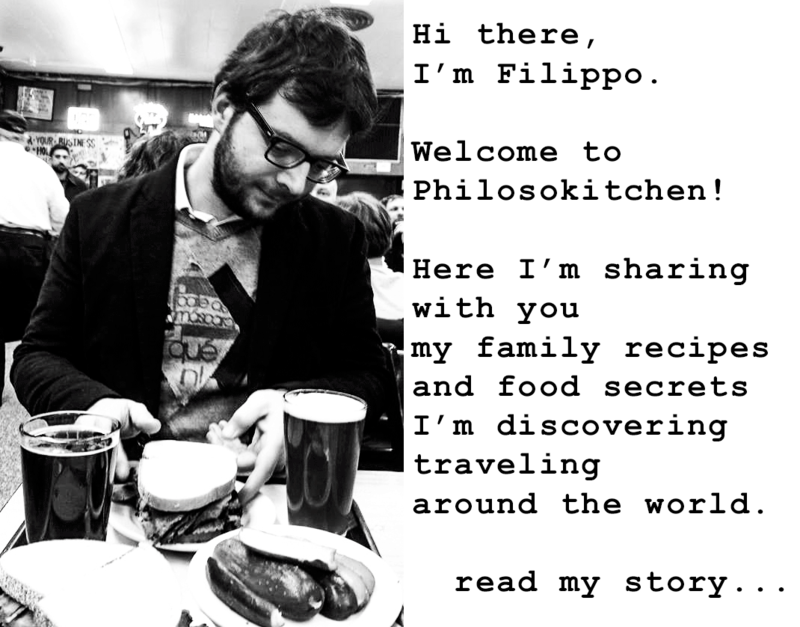 Thank you so much for sharing – can’t wait to make my own at home! I e been looking for a recipe that is for canning and this looks like exactly what I wanted. Can’t wait to make it.